Welcome to our little piece of paradise. Just across the bay from Coral Gables/Coconut Grove and over the scenic Rickenbacker Causeway, this barrier reef island remains one of Miami’s most desirable and unique residential communities – a quiet retreat that moves at island pace with quick and easy access to vibrant cosmopolitan Miami. Key Biscayne real estate is perfect for families with children, and those looking to be close to an international city and business hub, yet provides just enough distance to live a secluded lifestyle in a sophisticated, enchanting community. Island living provides residents freedom to take a step back from a busy schedule, reflect, and enjoy quality time with family and friends. Village apartments for sale, as well as single family homes on Key Biscayne offer the opportunity to live as if you are on vacation 24 hours 7 days a week. Nestled on the southern point between Biscayne Bay and the Atlantic Ocean, there is no where in the world that offers a setting quite like this magical place loaded with Old Florida charm, large waterfront estates, a scattering of bungalows, and an enclave of tastefully appointed condos for sale. 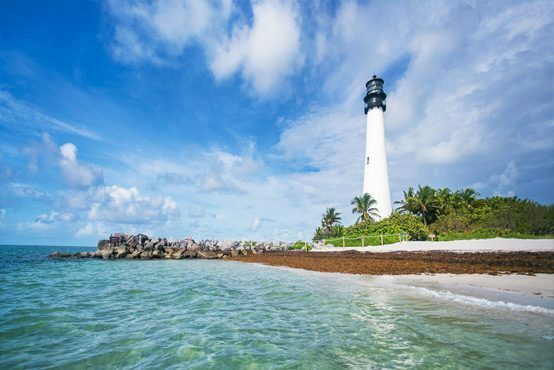 Key Biscayne island creates an intimate, fun-filled lifestyle for the water and outdoor enthusiast. Boating, water sports, beachcombing, and nature and state parks on this stretch of real estate is plentiful and accessible daily in sunny South Florida. The streets are paved for walking here, whether it’s on the shore or through the Village Green. You’ll find a large variety of dining options available on the island. Argentinian,Italian(Tuscan), to Mediterranean inspired, Portuguese and Peruvian influenced or a great steak or even just a perfect pizza, one does not have to leave the island to savor a great culinary experience. The village is a perfect place for an individual who wants to be close to the energy of cosmopolitan Miami but indulge in the benefits of a low key tropical oasis. Rated one of he safest cities, Key Biscayne has two exceptional A-rated public schools; Key Biscayne School for Kindergarten through 8th grade, and Mast Academy for 9th through 12 grade. For private school options, St. Agnes Academy for Pre-K through 8th grade and St. Christopher By the Sea for preschool through 6th grade are stellar choices. Additional nursery and preschool programs include Key Biscayne Community Day School and Key Biscayne Presbyterian Church School. All of the island’s schools offer a great education in a nurturing environment at a progressive but slower pace than you will find in bustling Miami. To learn more about Key Biscayne, Coconut Grove, Coral Gables, South Miami, Pinecrest, or Palmetto Bay, contact Val Byrne with EWM Realty International or www.MiamiRealEstateWorks.com at email at [email protected] or by phone at 305-323-6231. Val Byrne – Working For You!